Canon has announced that their DR-5010c has been discontinued. I know for some of you that sounds like bad news. You have enjoyed seeing it zip through piles of documents and automatically file them in Laserfiche using Quickfields. It has been your work horse. But, there is good news! 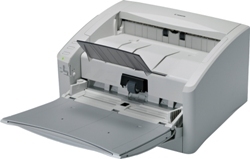 Canon has a new scanner the Dr-6010C which scans 60 pages per minute, with a duty cycle of 7500 pages per day. The warranty is much better too, it comes with a one year advanced exchange warranty.